Congratulations to "Rachel B. ", the winner in Angi's giveaway. Thank you to all who participated! The Billy the Kid Museum will help you make up your mind if he really died in New Mexico or if he recovered and moved back to Texas. The historic downtown is exactly what a hometown should look like and inspired a lot of the story in GUNSLINGER. This home inspired a scene. Can you guess where the hero was pinned down? Bryce scrambled behind his back. He gave up and went inside to drop his weapon, shirt and glasses. He didn’t need to see up close to mow the lawn anyway. The briskness of the AC helped cool his frustration. A little. 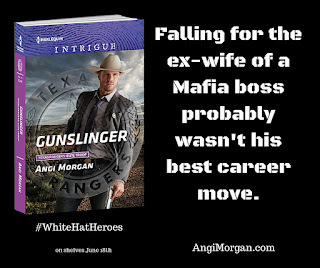 Leave a comment to be entered for an autographed copy of GUNSLINGER (international drawing ends at midnight 5-24). Enter the Rafflecopter drawing for your chance at an additional prize (ends 5-31). Giveaway on JRS ends at midnight May 24th. Giveaway through Rafflecopter ends on May 31st. Contestants who enter the Rafflecopter drawing can register for additional chances by leaving a comment on Just Romantic Suspense, click the JRS comment to receive your extra entries. How about you? Do you believe the Hico legend about Billy the Kid surviving Pat Garret’s bullet? "What legitimate undercover Texas Ranger mows a lawn trying to get a woman’s attention wearing a shirt?” :) Love the humour! I need to read this book. This year, I have promised myself to read more romantic suspense and so far it doesn't look good. Pls count me in! I hope you meet your goal, Natalija. I promised myself I'd read more too, I'm also behind. I had never even heard a different version of his death until I drove through Hico and looked it up. It's fun to think that Billy the Kid may have survived. Legends make for a good story....smile. Love your books. I think so , too, Brenda ! Thanks Thanks Thanks -- glad you enjoy them. What a fun scene. l Love the pictures too thank you. I didn't know about the Hico legend. That looks like a neat town to visit. I hope you can one day ... don't forget the pie ! I had no idea about the legend. What a neat town you always find the best! I'm not very familiar with the legend, but it sounds like a fun museum and town to visit! I hope you get there someday Lynn. Thanks Patty. I hope so, too ! You should check out the research...sort of cool.